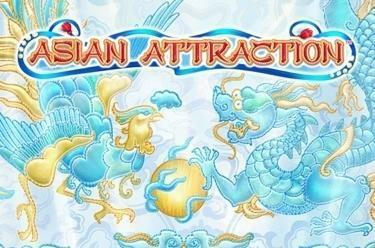 Play Asian Attraction™ online for free now! Japan’s culture has always been fascinating: Dive into it head-first with Asian Attraction™! Four charming ladies as beautiful as lotus blossoms and well-trained in the arts of entertainment are waiting for you in this slot with Asian flair. They’re especially enchanting in the free games, where they stand ready with an especially big amount of Twist winnings! 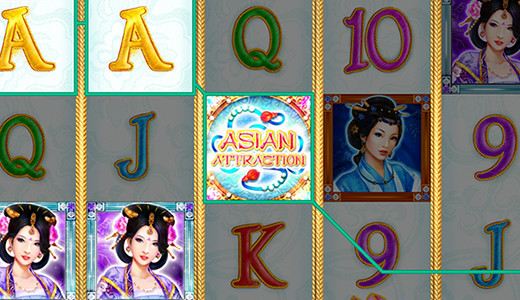 In Asian Attraction™ it is your aim to line up 5 identical symbols on one of the 20 win lines that run from left to right across the reels. The Wild symbol is the Asian Attraction logo: It can substitute for all other symbols of the game except for Scatter and improves your chances of landing a winning combination. The lotus blossom is the Scatter: If it appears 3 to 5 times on any of the reel positions at the same time, free games with upgrade feature are triggered. If you land at least 2 lotus blossoms (Scatter) on any of the reel position, 10 free games are triggered at the settings of the last normal round. During the free games, the upgrade feature is activated: If he bronze lady appears on the middle position in reel 3, she transforms into a silver lady. If the silver lady then appears on the aforementioned positon, she’ll turn into a gold lady. The same goes for the gold lady, when she falls onto the right position you’ll be rewarded with a diamond lady. Each upgrade nets you more free game rounds. If a Scatter symbol appears on the middle position of reel 3, you’ll receive 3 more free games!